style="text-align:center;"> Please note that this topic has not had any new posts for the last 2853 days. My OH has/had a CC with RBS. Back in July we told them we were having financial difficulties. We have done everything they have requested with financial statements and answering letters, returning the credit card. But today he has had 2 letters. One saying they accept our repayment offer but this is £4 more than our offer. But no details on how to pay. And the second stating " a default notice has recently been served against you. As they amount requested in the DN has not been received, your account has been terminiated." We have never received a DN. Can anyone tell us how to proceed with this. I have also asked them not to phone and they still do. When I asked why they are still phoning said they have to show that they are making contact by phone or letter. When I a said you are sending letters why phone he replied "because we do and will continue to phone" and this phone call was on a Sunday! Sorry for rambling on! Just need a little advice on what to do next. How old is the account and are there any charges you could re-claim. The account is probably about 2 years old. No idea about charges. Sorry to nag but has anyone any advice for me? First piece of advice I like to offer, is to never speak on the 'phone, do not answer their security questions and just repeat ' in writing only' and put the phone down. They are not entitled to your Income and Expenditure, and you can pay the amount that is comfortable for you, despite their letter. I am writing in relation to the quantity and frequency of telephone calls that I have received from your company, which I deem to be personally harassing. I now require all further correspondence from your company to be made in writing only. I am of the view that your continued harassment of me by telephone puts you in breach of Section 40 of the Administration of Justice Act 1970, and the Protection from Harassment Act 1997. If you continue to harass me by telephone, you will also be in breach of the Communications Act (2003) s.127 and I will report you to OFCOM, Trading Standards and The Office of Fair Trading, meaning that you will be liable to a substantial fine. “S40 Punishment for unlawful harassment of debtors. A person commits an offence if, with the object of coercing another person to pay money claimed from the other as a debt due under a contract he- harasses the other with demands for payment which, in respect of their frequency, or the manner or occasion of making any such demand, or of any threat or publicity by which any demand is accompanied, are calculated to subject him or members of his family or household to alarm, distress or humiliation; falsely represents, in relation to the money claimed, that criminal proceedings lie for failure to pay it; falsely represents himself to be authorised in some official capacity to claim or enforce payment; or utters a document falsely represented by him to have some official character, or purporting to have some official character which he know it has not. Write also and tell them you will ONLY pay by standing order and request their bank details for this. Thanks Harrassed Senior, I will send the letter off today and see what happens. The general advice is to start with a CCA request, you have the right under the Cunsomer Credit Act 1974 to request a copy of it together with a statement of account, they must then supply it within 12 days of receiving the request (also allow 2 days for postage). If they don't, the account goes into dispute and the they are not allowed to take any enforcement action. Upon receiving it, remove all personal details, barcode and other information that could be used to identify you, scan it and post it here. People will be able to advice you further from that point on. 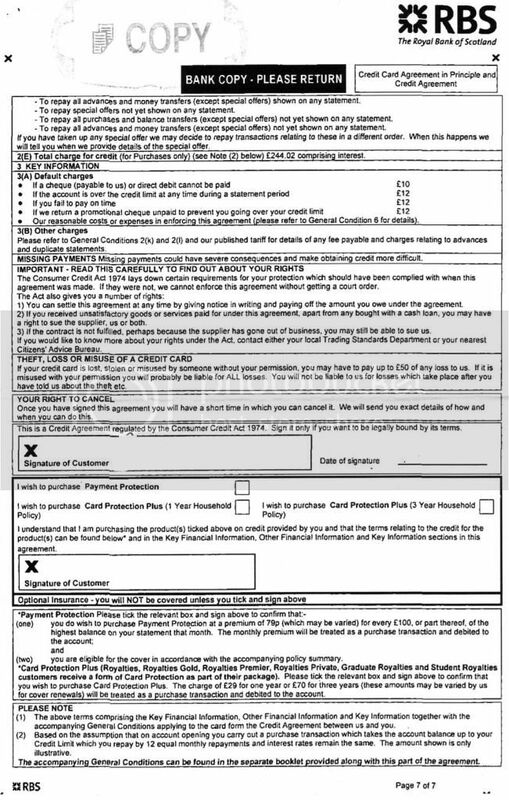 With reference to the above agreement, I would be grateful if you would send me a true copy of this credit agreement and a full breakdown of the account including any interest or charges applied. I understand that under the Consumer Credit Act 1974 [sections 77-79], I am entitled to receive a copy of any credit agreement and a statement of account on request. With regards to the section above can you please supply me with a complete list of transactions and charges relating to my account with your organisation. Alternatively, a complete set of statements for that period will be acceptable. Under the Consumer Credit Act 1974 creditors are unable to enforce an agreement if they fail to comply with the request for a copy of the agreement and statement of account under these sections of the Act. Should you supply me with only a reconstituted version of the Credit Agreement, I will appreciate it if you can supply me with the reasons for doing so and why you didn’t supplied a copy of the original signed agreement. I enclose the statutory fee of £1. You have 12 days in which to comply. Please note that for security reasons I didn’t sign this request and I draw your attention to the fact that the Consumer Credit Act 1974 does not require that I supply you a copy of my signature before you comply with my section 77/78 request. Furthermore, the above address is the one which you normally sent statements and correspondence containing extensive sensitive private information to my address and which you use to communicate my private business to me and which you have hitherto found to be acceptable. Print your name, DO NOT sign! You have to include a £1 payment, either cheque or postal order. 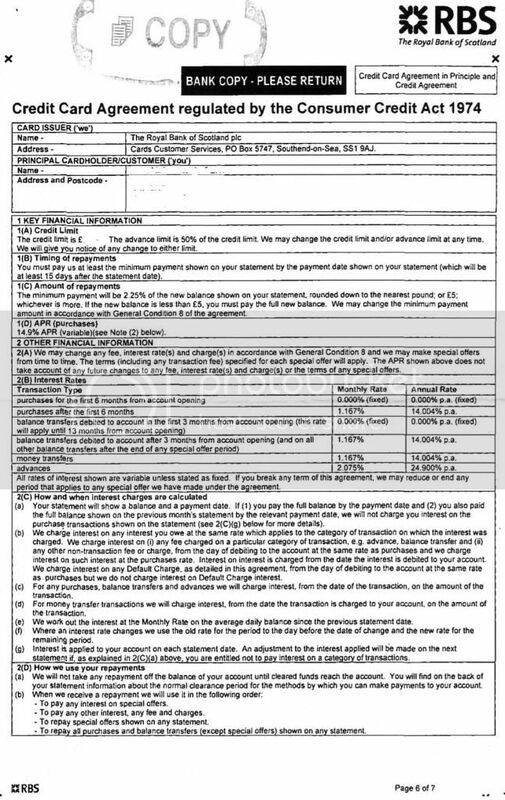 You should be able to get also statements that could tell about charges and PPI, which you can reclaim. The second (or first!) piece of advice is the telephone harrasment letter but HS provided it. “We believe Capital One Law takes privilege over UK Law” – Sven Lagerberg – Capital One. ALWAYS send these letters recorded, so that they cannot deny that they received them! OK, will do that. Sneaky aren't they? Just about to send the letters but I am unsure which RBS address to send the telephone harrassment letter to. Thanks Lord Tiger that is the one I have sent it to. Now lets see what happens. Thanks again. Just had another letter off RBS stating they do not accept our offer and will be issueing Default Notices. The worrying thing is they have included our mortgage, which is arrears but with their knowledge and permission. I am getting very worried now. Is there anything I should be doing? In this latest letter they would like us to ring and discuss how they can "assist" us. Many thanks for any advice. The general advice is NOT to phone them, they will just try to put pressure on you. By not phoning them you WILL NOT be worse off in anyway! There is no rule, legislation, indication or anything that discussions must be made over the phone, they are just trying to use it to their advantage. Did they responded to you CCA request?, if not then you can put the account in Dispute and there is not much they can do while it is in dispute, they will try but they are teethless. Can you clarify what you mean by the inclusion of the mortgage? Did they combined them or is it 2 seperate issues? If seperate they you will have to deal with each on its own. They have listed 3 accounts, one mortgage, one loan and our overdraft. It seems they are treating each one seperately on one letter. No response from the CCA yet but that is for a credit card, the time limit for that is the 7th of Oct. They're combining 3 things in one letter to frighten you; keep them separate in any replies because they are subject to different law, regulations and guidance. Obviously the mortgage is critical so make sure you maintain a proper paper trail of what has been agreed. If you are in arrears with your mortgage ( a priority debt) then you probably cannot afford more than you are offering. I know I shouldn't have but I phoned the mortgage dept and they said just to keep paying what we have agreed and it will be ok. We don't have any paperwork so show what we have agreed as OH did it all by phone as we were making manual payments at the time but we have been told it is all on the system. It is critical that you are keeping your head clear and realise what they are doing! They use any trick what they can think of to pressure you and this is the purpose of combining the 3 thinhs in one letter. Ensure you are keeping them seperate. The mortgage is certainly your priority and it is understandable that you felt you had to phone them. You can always insist that they confirm what was said in writing to you. If you have an agreement and you are keeping up your part, then there is nothing they can do, but it is important that you have it on paper. You say they mentioned it is all on the system, you can always make a SAR (unfortunately it cost £10) but then you will have a paper copy of what "is on the system". IMHO that will give you peace of mind as well as evidence. I feel more calm now! Can anyone have a look at this and let me know if it is ok. I have removed all personal details. The agreement was signed by OH but it was not dated. Sorry to be a pain but has anyone any idea if this is ok. 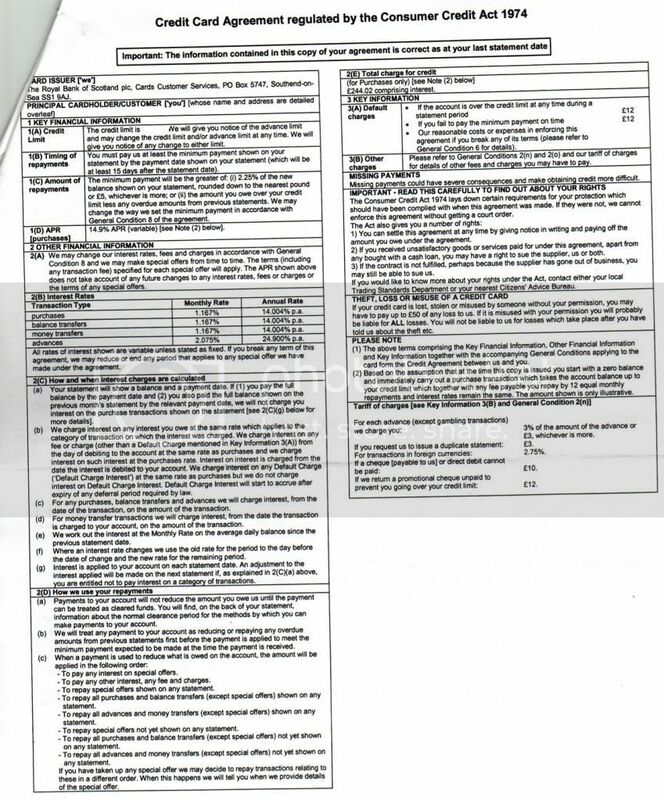 Sorry to nag but has anyone any idea if this is agreement is ok.
First link doesn't work, second two are OK, but on the 2nd scan it states at the bottom of the page 'page 7 of 7' where are the others? I am a little confused as to whether you signed this on their premises or not, at first I thought you had, but then read your right to cancel will be sent under different cover at a later date? Sorry for not replying sooner, having marriage crisis talks so not a very good time at the moment. I think this is the correct link for the other page. Although it does say there are 7 pages these were all I received from RBS, even though I sent the £1.00 Postal Order. The agreement was signed by OH at our house and then posted back to the bank. He didn't date it.